I collect craft tutorials on my pinterest page and like to share them here from time to time. Here is a particularly nice one by Laura Carson on her Gingersnap Creations blog. 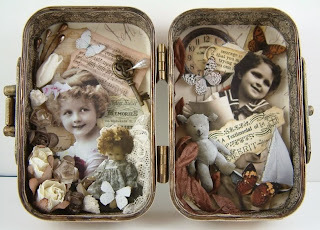 Laura has created a wonderfully detailed explanation for making a charming altered book with an altoid tin. If you're like me (and my husband) you always a supply of those great little tins lying around! They're too cute and useful to through away, but you need a creative way to alter them. Gingersnap Creations: Laura Carson: Making an Altoid's Tin Book: In this tutorial I’ll walk you through creating a vintage Altoid’s Tin book using chipboard and two Altoid’s tins. Secret Sale on Asian Images for Blog Readers! Asian Art & Ephemera Challenge: Second Week! Music and Dance Challenge: Second Week!